Audio Qigong instruction with a special emphasis on visualizing the flow of subtle energy. Four Golden Wheels Exercise—Essential Qigong practices for deepening your experience of your subtle energy flow. "The way of Qigong allows you to deepen your capacity for wisdom, love, and vitality," teaches Robert Peng. Here is an invaluable resource of Qigong practices to reawaken your inner fountain of youth, balance the forces within and without for harmonious living, and open clear and abundant channels for life energy to flow. 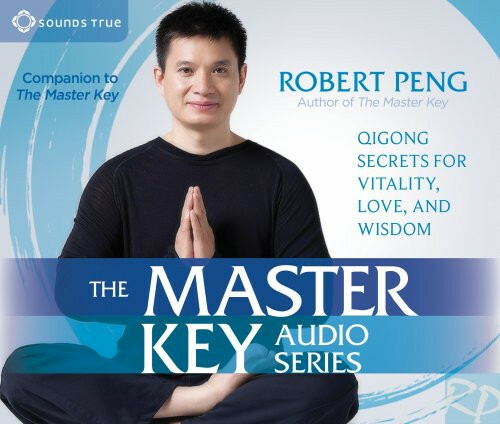 Review for The Master Key Audio Series Review by Ruth S.
My experience of doing the Qi gong exercises is one of absolute bowing and awe to the love that is present. The energy that is now entering is touching and healing parts of me that have never been touched before. I use this audio series together with the video series and the book. I have bought many books and videos about qigong and practice Taijiquan since many years. This Master Key Series is excellent and I enjoy practicing the excercises daily.